Chops big bales of straw, cardboard or paper to make fluffy and spongy bedding. 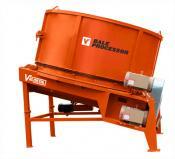 Can be used to spread bedding evenly up to 40' in free stall barns, hog barns and poultry barns. Stationary big bale chopper for dry or wet bales.